Online magazine The Montana Mint published a list of recommended books about Montana recently. The post is titled “The Greatest Books Ever Written About Montana.” The claim implied in this title is quite a stretch, but they do recommend some wonderful books. Some of these I recommend to you, in turn. Of course, you are already familiar with Norman Maclean’s A River Runs Through It and Other Stories (1976). Maclean fans might also enjoy Ivan Doig’s This House of Sky: Landscapes of a Western World (1980), in which the author is nearly as poetic about the Montana landscape as Maclean. The Montana Mint lists several other Doig titles, as well. Another worthwhile read is A.B. 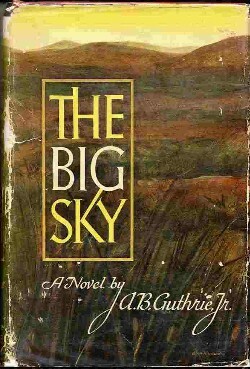 Guthrie, Jr’s The Big Sky (1947). This classic novel is a deeply engaging and sometimes disturbing fictional account of the mountain men, set during the first half of the 1800s. It left quite an impression upon me, as a young man. Its 1949 sequel, The Way West, won the Pulitzer Prize for Fiction. For a Native American perspective upon the sort of Indian/white interactions described by Guthrie, read James Welch’s Fools Crow (1986). Welch was a Gros Ventre/Blackfeet author, who remains a looming figure in Native American literature. In Fools Crow, he tells the story of a fictionalized Piikani Blackfoot man. The story culminates with the 1870 Bear Creek (Marias River) Massacre, during which the US Army murdered approximately 200 Piikanis. Fools Crow does not mesh perfectly with Blackfoot oral histories, but it is a compelling book that certainly conveys Native emotions about such devastating events as that which occurred in 1870. For the full list of books recommended by The Montana Mint, see their post. This entry was posted on March 13, 2017 at 3:23 PM and is filed under Environmental Literature, Fly Fishing Literature, The Arts. You can follow any responses to this entry through the RSS 2.0 feed. You can leave a response, or trackback from your own site. Thanks for the recommendation, I’ll see if I can track down a copy. Which one, Ben? Regardless, enjoy.